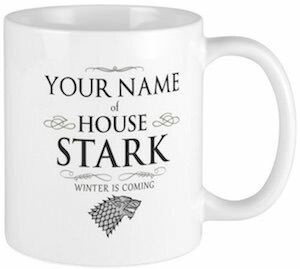 Now you can get this amazing Personalized House Stark Mug for all the true Game of Thrones fans. This is a white ceramic Game of Thrones mug that will have your name on it and the text “of house Stark” and then below that, it says “Winter Is Coming” and you find the wolf from the Stark logo. This mug is just great for a true Game of Thrones fan as they are made part of the Game of Thrones story and that makes this an amazing present too for a Game of Thrones fan in your life. This Game of Thrones mug can hold 11oz of your favorite beverage and it is microwave and dishwasher safe.